My ten year old loves to cook and she helps me prepare dinner several times a week. Earlier in the week she asked if she could cook dinner Saturday night. She informed me that she wanted to cook the entire meal herself and just have me offer guidance. 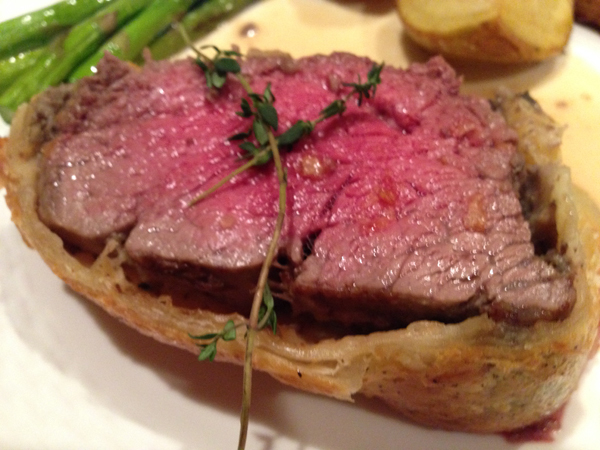 The dish she chose was Beef Wellington! Quite advanced for a ten year old…but I was happy she was aiming high. On Saturday morning I set out to the store to get the ingredients and gave her the recipe to study. Working in the steps outlined, with nothing but supervision from me, she made an absolutely delicious, elegant dinner that made me tremendously proud. Many of the recipes you see for Beef Wellington call for prosciutto. But we did it the old fashioned way with duck liver pate and it was superb. If you prefer to use prosciutto, by all means you can substitute that for the liver. To make the Duxelles, add the mushrooms, shallots garlic and thyme to a food processor and pulse until finely chopped. Heat the butter and olive oil in a skillet and sauté over medium heat. Add the mushroom mixture and sauté for 10 minutes until the liquid has evaporated. Season with salt and pepper as it cooks, and then set aside in a bowl to cool. The Elegant Occasion Note: This can be done several hours ahead of time. Drizzle the beef with olive oil, season with salt and pepper and sear the meat on both sides. About three minutes per side. Be sure to keep the string on so that the meat stays together while being seared. Turn the heat off, remove the string and brush the meat immediately with the Dijon Mustard on both sides. Place the meat on a plate and allow to cool for 20 minutes. Place a large sheet of plastic wrap on your work surface (a little over a foot). Place the meat in the center of the plastic wrap. Spread the pate all over the top of the meat and then using a spatula spread the duxelle mixture on top of the pate in a thin layer. Roll the meat up tightly in the plastic wrap and be sure to seal up the ends. Place the meat in the refrigerator for at least thirty minutes. The Elegant Occasion Note: The meat can be done up to this point up to 3 hours in advance and kept cold in the refrigerator. Spread one tablespoon of flour on your work surface. Roll the puff pastry out to ¼ inch thickness. Remove beef from the plastic wrap carefully and set it in the center of the pastry. Fold the pastry over the beef, and brush with egg wash to seal. Brush the ends with egg wash and fold over to completely seal the sides of the beef. Place the beef seam side down on a parchment lined baking sheet. Brush the entire pastry with egg wash and make four slits in the top of the pastry to allow the steam to escape and to aid you in cutting the portions. Sprinkle the top of the pastry with a little salt and pepper. Bake for 35-45 minutes in a 400 degree oven until the pastry is golden and the beef registers 125 degrees. Remove from the oven and let the wellington rest for 10 minutes before cutting. Cut into slices where the slits indicate and garnish with thyme sprigs and serve with the sauce below if desired. Place the olive oil in a small saucepan over medium heat. Add the shallot and garlic and thyme and cook until the onion and garlic soften and become translucent. Add the beef stock, heavy cream and mustard, salt and pepper and whisk until combined. Let the mixture simmer for 7 or 8 minutes, whisking frequently. Serve the sauce alongside the beef wellington, or drizzle some on top of each piece.